As soon as we arrived home I was back at the doctor's office. The tumor in my mouth was so large it was threatening to block my airway and suffocate me. I was feeling fine at the time; to look at me you would not know anything was wrong. However this nasty tumor would end my life during the night if it wasn't dealt with. Dr. Hinkley has researched a plan to de-bulk the tumor which would require placing small beads in the arteries that were supplying blood to the tumor. The beads couldn't remain there because those arteries also supplied blood to my face. Once the blood supply was stopped they would be able to take out as much of the tumor as possible. It would possibly give me more quality time. It took a few days for hospital approval of the surgery and in the meantime I had things to do. My grandpa and grandma Scott invited us to go for a boat ride on the river. It was a cold day but I didn't care, I wanted to be anywhere but in a hospital. While going up the river we chased pelicans and enjoyed the ride. Part way through the ride I fell asleep in mom's lap. The breeze felt so nice and I was really relaxed. The ride ended too soon and I didn't want to get out of the boat. 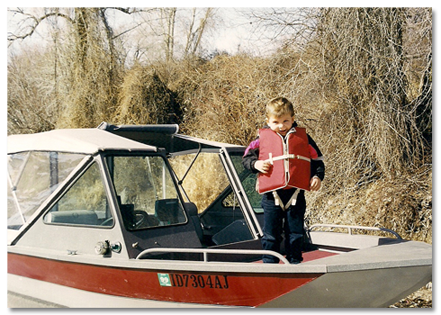 I told grandpa that I would ride home in the boat and I was trying everything to avoid going to my scheduled appointment at the hospital that afternoon. When mom and I arrived at the hospital they told us they were sorry they didn't call but the appointment had been cancelled and rescheduled for another time, no big deal just come back later. Mom was very upset because she knew how much I wanted to stay in the boat that day and I could have stayed longer if they would have called. She knew I wouldn't get another chance to ride the river again. The day of the surgery came and it would be done it two parts. First they would insert the beads into the arteries and I would have to remain perfectly still for 24 hours. That would cause the tumor to shrink due to lack of blood. The second part would be removing as much of the tumor as possible. While I was asleep after the first part of the surgery mom had all the Disneyworld pictures developed so I could see them when I woke up. In order to complete the second surgery they had to give me a tracheotomy. The surgery was successful and they removed as much of the tumor as possible. They sent the tumor to a bigger hospital for research so they could learn more and maybe prevent another kid from going through this. When I woke up I was so mad because I couldn't talk. I quickly learned that I needed to push on my throat to make a sound. While in surgery a mold of the roof of my mouth was made because I would need a retainer to block the hole in my mouth when I ate food. I was able to leave the hospital the following day and I felt good. It was very difficult for my parents to see how lively I was and yet know that the clock was ticking. They received advice and suggestions from several different people on what they should do for me. They prayed that a miracle would happen. One of the suggestions was to use shark cartilage, but if I was to go back to the hospital they couldn't tell anyone where they got it. Every suggestion sparked hope, but when researched would not work causing a roller coaster of emotions. It only took two weeks and the tumor was back. I no longer needed the retainer because the tumor plugged the hole. The doctor told mom to check it regularly and call anytime if there were big changes. A well meaning Christian lady told mom that if she had enough faith I would be healed. Mom prayed all the time and every time she would check my mouth she would panic because the tumor was growing and she felt that her lack of faith was killing me. She prayed for the Lord's direction and courage to face the future. Her answer came the next day while we were getting ready for our walk around the greenbelt. Before we got out of the car I said, "Mom, you know I'm going to die soon," she was very surprise at my comment because neither she nor dad had ever said anything about it when they were around me. She asked how I felt about that and I told her that I was going to be with Jesus and there was no better place than that. Mom said that was an answer to her prayers. If I had peace about where I was going, she could too. From then on we lived life to the fullest and were thankful for every moment we were given.